Human VEGF-B, His Tag (VE6-H5225) is expressed from human 293 cells (HEK293). It contains AA Pro 22 - Ala 207 (Accession # P49765-1). The protein has a calculated MW of 20.3 kDa. The protein migrates as 19 kDa and 32-40 kDa under reducing (R) condition (SDS-PAGE). Human VEGF-B, His Tag on SDS-PAGE under reducing (R) condition. 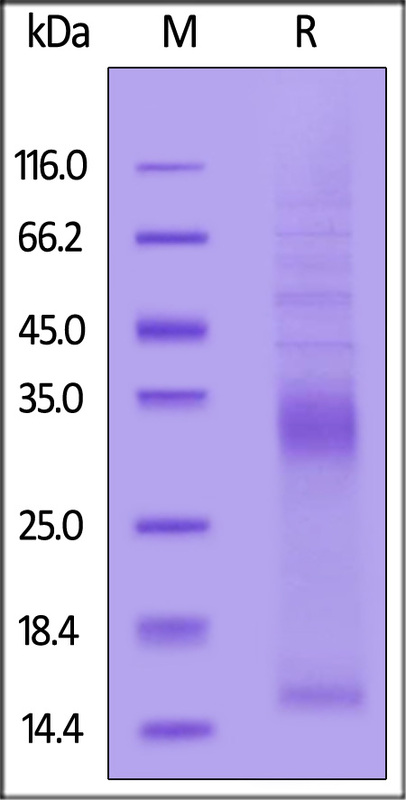 The gel was stained overnight with Coomassie Blue. The purity of the protein is greater than 90%. Immobilized Human VEGF-B, His Tag (Cat. No. 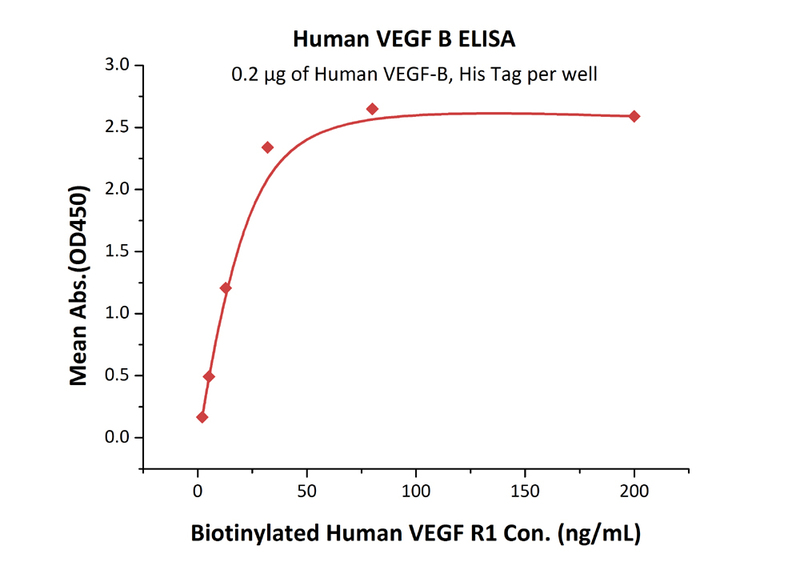 VE6-H5225) at 2 μg/mL (100 μL/well) can bind Biotinylated Human VEGF R1 with a linear range of 2-32 ng/mL (QC tested). Vascular endothelial growth factor B (VEGFB) is also known as VEGF-related factor (VRF), is a secreted O-glycosylated protein, which belongs to the PDGF/VEGF growth factor family. VEGFB is expressed in all tissues except liver. Highest levels found in heart, skeletal muscle and pancreas. VEGFB is growth factor for endothelial cells. VEGF-B seems to play a role only in the maintenance of newly formed blood vessels during pathological conditions. VEGF-B also plays an important role on several types of neurons. It is important for the protection of neurons in the retina and the cerebral cortex during stroke and of motoneurons during motor neuron diseases such as amyotrophic lateral sclerosis.VEGF-B167 binds heparin and neuropilin-1 whereas the binding to neuropilin-1 of VEGF-B186 is regulated by proteolysis. (1) Olofsson B., et al., 1996, Proc. Natl. Acad. Sci. U.S.A. 93:2576-2581. (2) Iyer S., et al., 2006, J. Mol. Biol. 359:76-85. (3) Zhang F., et al., 2009, Proc. Natl. Acad. Sci. U.S.A. 106 (15): 6152–7.